In our last post, we saw how the potential of atoms had been pushed to an incredible limit by the work of Commins and his group at Berkeley. Now, the 21st century had arrived, and technology was ready to start utilizing the power of molecules, which are nature’s built-in mini-laboratories for the electron. A molecule is simply a group of atoms united by a chemical bond – either covalent or ionic. Currently, all EDM experiments have only managed to utilize diatomic molecules, which consist of exactly two atoms bond together. Just like atoms, molecules also have a structure consisting of electrons orbiting a center, only that the center consists of two instead of one nuclei. Therefore, looking for an electron EDM in a molecule is similar to an atom in that we measure the energy levels of the molecule very precisely, hoping to find some small shift caused by the electron’s asymmetry. More specifically, these experiments use polar diatomic molecules. These are diatomic molecules which are made of two very different atoms, one large and one small – such as ytterbium fluoride (YbF), which has one large ytterbium (atomic number 70) and one relatively small fluorine (atomic number 9). This creates a molecule that is very asymmetric (like the North and South poles of a compass magnet), making it easier to align with the direction of an applied electric field. In contrast, a single atom like thallium which Commins and co. used is mostly spherical, which is why they needed to apply electric fields of tens of kV/cm in their experiment. The difference in structure between atoms and molecules, which becomes apparent when applying an electric field in the laboratory (symbolized by the blue arrows). In a single atom, there is no clear direction for the atom to align itself, so even a very strong electric field results in weak alignment. In contrast, a diatomic polar molecule already has an asymmetric structure, giving it a sort of directionality that naturally aligns itself with the electric field – either completely along it or completely against it. Why do we want to align atoms and molecules to an electric field? It’s because it’s absolutely necessary in an electron EDM experiment – the idea is that by doing so, one also subjects the electron zooming around the nuclei of the molecule to this electric field, allowing us to see whether it is electrically spherical or not, which is what an EDM is. As we covered in our first post, by subjecting the electron in an atom to an electric field, the effective electric field ( ) experienced by the electron is hundreds of times larger than the applied field. It’s similar for the case of a molecule like YbF, only that thanks to the polar structure above, is hundreds of thousands of times larger than the applied field. In the case of thorium monoxide (ThO), used by the ACME EDM experiment that I work on, the enhancement is tens of billions of times larger – literally gigavolts per centimeter of electricity inside these tiny molecules! It would be unimaginable to apply gigavolts of electricity in a laboratory setting – that would simply result in uncontrolled bursts of indoor lightning. The electricity bill would go through the roof. But Nature has provided us with the means to generate this electric field naturally, in these tiny diatomic laboratories. However, this incredible perk comes at a price: molecules, due to their complex, multi-atomic structure, also have a more complex energy structure compared to atoms. Unlike an atom, where the main difference between energy levels is electronic structure, or what orbital an electron occupies (lower orbital = less energy, higher orbital = energy), a molecule has many different ways of expressing its energy. Besides electronic structure, a diatomic molecule can rotate and vibrate, resulting in two additional independent degrees of freedom. Differences in complexity in energy levels between atoms and diatomic molecules. An atom only has different electronic states, while molecules also have rotational and vibrational states. These additional energy states make molecules more difficult to manipulate. In a typical experiment, we want all of our molecules to occupy the exact same state – electronically, rotationally, and vibrationally. But our normal tricks with lasers and electric and magnetic fields that we normally apply to atoms don’t work as well with these molecules – they often result in a smaller proportion of the molecules ending up in the state we want. The additional complexity given by molecules is what made it take almost a decade since Commins’ 2002 experiment to finally obtain a small improvement on the measurement of the electron EDM using them. This was accomplished in 2011 by the group of Ed Hinds at Imperial College London, using ytterbium fluoride molecules. Like the Berkeley group, Hinds and co. also applied tens of kV/cm of electric field. But thanks to the polar nature of YbF, the effective electric field experienced by the electron was 220 times larger. In addition, the energy structure of the molecule naturally suppressed the motional magnetic fields that had doomed the Berkeley experiment. That being said, there were other difficulties introduced by molecules that weakened the natural advantages of using molecules. One could simply not produce as many YbF molecules in the right state as one could thallium atoms. Initially, the group produced a beam of molecules using an oven, similar to atomic beam groups. The result they obtained in 2002 was an order of magnitude less than Commin’s. Later, the group developed a more advanced method of producing YbF molecules: a high-powered laser is pulsed towards a target of ytterbium powder mixed with some other chemical that contained a fluoride atom. The energy from the laser liberated some YbF molecules from the target, resulting in a high-flux, pulsed, supersonic, cold jet of molecules usable for an EDM experiment. But even with this improvement and others, the groundbreaking work of this experiment could only improve upon the 2002 Berkeley result by a factor of 1.6. Besides YbF and ACME, in the mid-2000s there were other attempts to measured EDMs using molecules, such as the lead oxide (PbO) experiment by David DeMille at Yale. This was an experiment done in a cell, similar to the one done by Hunter using cesium at Amherst two decades before. Ultimately, however, this experiment did not manage to obtain a competitive limit on the electron EDM, because it was plagued by systematic errors related to magnetic field gradients. However, it demonstrated the feasibility of using yet another molecular feature to one’s advantage in these types of experiments: the internal co-magnetometer. 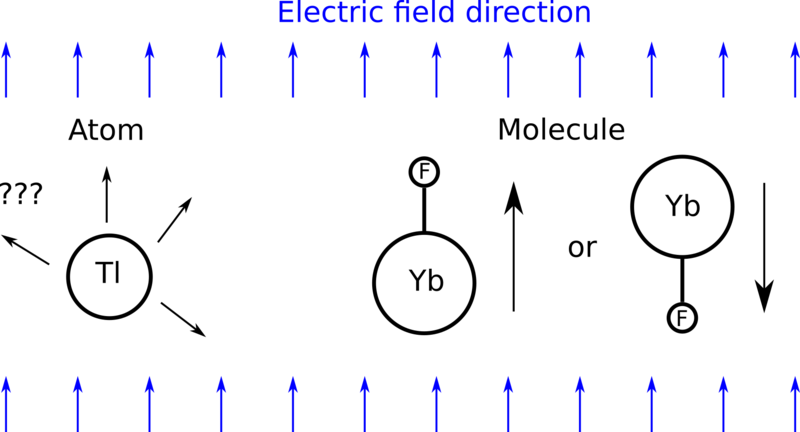 An integral part of any electron EDM experiment, besides applying an electric field to an atom or molecule, is to repeat a measurement while reversing that field, in order to separate out the natural electric dipole of the atom (which would blindly follow the direction of the field) and the electric dipole of the electron (which would not reverse with the field). Up to this point, this had been performed by physically reversing the direction of the electric field in the lab, usually by reversing the voltage on the plates that created the electric field from positive to negative and vice versa. But there are practical limitations to this: due to limitations of electric power supplies, it is often impossible to perfectly reverse the voltage. So instead of say, +20,000 V and -20,000 V, you get +20,000 V and -19,995 V. Although the difference might be very small, we’re also attempting to perform a very precise measurement. 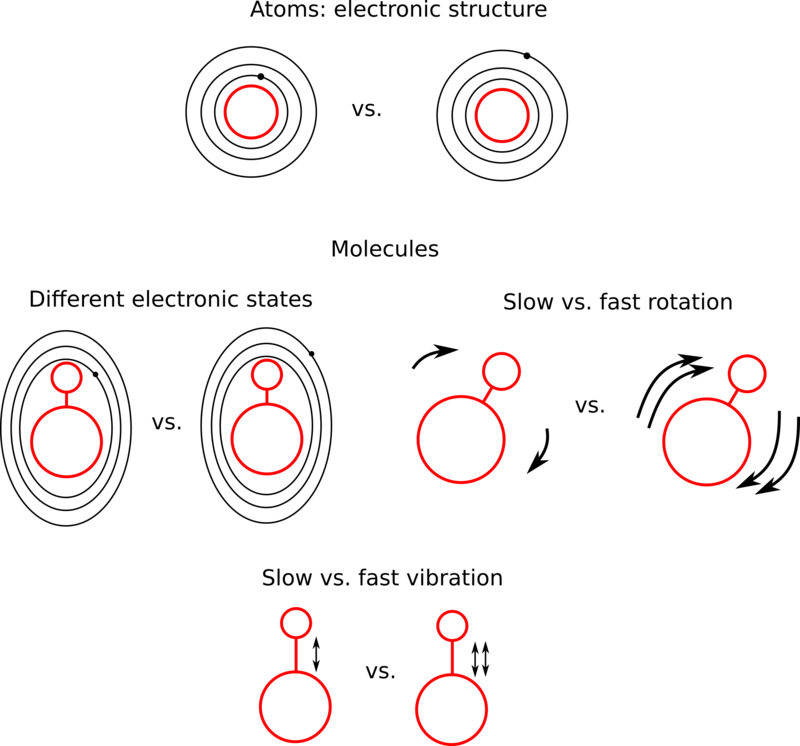 An illustration of two energy states within the ThO molecule. 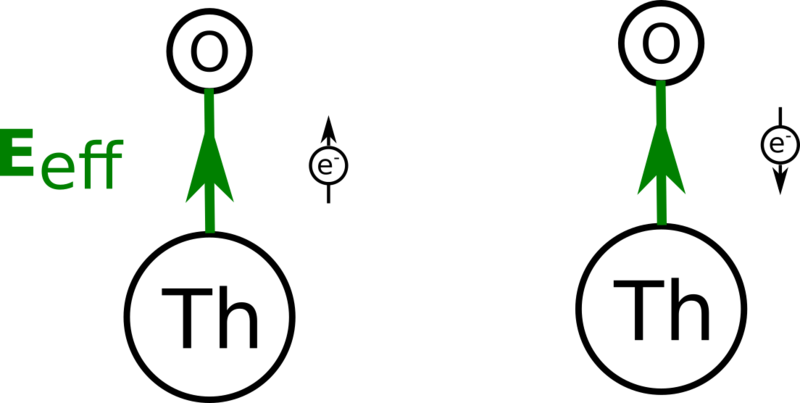 In one state, the electron’s EDM is pointed in the same direction as , the internal electric field (which is always along the axis connecting the two atoms in the molecule). In the other state, the EDM is pointed in the opposite direction. Now, how exactly is this better than simply switching your laboratory power supplies? It’s much easier, because these two states are usually very close in energy – such that one can simply shift the frequency of the lasers used in the experiment by a small amount in order to choose which state to do the experiment. Shifting the frequency of lasers is faster, more precise and efficient compared to shifting heavy duty laboratory power supplies. 2 In fact, one can often do this at a very rapid frequency – in ACME, the energy states are switched every half a second. This ability to reverse electric field very rapidly and precisely also contributes to the ability to eliminate other potential systematic errors in the experiment: it filters out all imperfections and unintended changes and disturbances occurring in the experimental apparatus, such that the only ones remaining are those that somehow relate to the internal co-magnetometer itself – something much subtler. With the advent of the internal co-magnetometer, the stage was set for the first major improvement on the measurement of the electron EDM, coming 12 years after Commins. The ACME experiment was conceived when it was realized that thorium monoxide (ThO), had several advantages to be used for EDM measurements. First, like YbF, it had a large – in fact, it was so easy to polarize that with only a weak electric field of 10 V/cm (a thousand times smaller than in the YbF experiment), one could obtain an of about 80 GV/cm – a billion times enhancement. Second, it had a set of internal co-magnetometer states. It could also be produced in sufficiently large quantities. There are several other more technical advantages that we won’t go into here, but suffice it to say, ThO seemed to be the “God molecule” for electron EDMs at the time. The experiment commenced, featuring a collaboration between three groups at two institutions: Dave DeMille (Yale – who was involved with the Commins thallium and PbO experiments), John Doyle (a major developer of molecular beam technology), and my own adviser Gerald Gabrielse (who had extensive experience performing very precise measurements of fundamental physics). There were some brilliant graduate students involved in the first generation ACME effort, some of whom are now professors in their own right, leading new efforts to measure electron EDMs (Amar Vutha at the University of Toronto and Nick Hutzler at Caltech). For a new precision measurement experiment, progress was rapid. Development of the experiment started at around 2007, while the final data analysis was completed by late 2013. While I was not involved in this first generation of ACME, I had the privilege of seeing the group in action in summer 2013, when I worked as a summer student under Dave’s supervision. My project was related to ACME, but towards improving it in the second generation. At the time, I had not even taken quantum mechanics and barely understood how the measurement was done. But the excitement and atmosphere caught on, laying the foundations for my current involvement as a graduate student on the experiment. Once again, the electron EDM was found to be perfectly spherical, even in the age of molecules. This result made some simpler extensions to the Standard Model of particle physics to be heavily constrained and increasingly non-viable (especially combined with other null results in experiments such as at the Large Hadron Collider). But while the theorists had to go back to the drawing board, so to speak, the experimentalists could rest on their great achievement for just a moment: finally, molecules were actually being used for precision measurements. Atomic physics traditionally preferred working with simple, almost Platonic systems like the hydrogen atom, instead of the messy molecules which are more relevant to most of the processes found around us. But here, physicists were able to take molecules and manipulate them at the quantum level to measure the even-smaller electron. It was no doubt, one of the major experimental feats of the decade.